A Killer Whale family surfaces as they pass in front of a fishing boat in the waters off Northern Vancouver Island, BC giving the crew a prime viewing location. A Killer Whale family appears on the surface of the water off Northern Vancouver Island in BC, Canada as a fishing boat heads towards them. The crew aboard this fishing boat will have a close look at this family as they pass by on their journey to places unknown. When a Killer Whale family groups together, they could be heading off to meet up with another pod of whales or to areas where the fishing is more plentiful. At times, the family will separate to test the waters on their own or to search for their own feeding grounds, but once the matriarch calls, the pod will regroup and continue on their way. Once back in their formation, the pod will either travel consistently in one direction in a moderate to fast pace or they may completely slow down and rest. Resting may be less than an hour at a time or stretch for periods of up to seven hours and the vocalizations coming from the Killer Whale family is minimal. When whale watching off Northern Vancouver Island, BC in the summer months, the likelihood of capturing a family photo is very real. Many pods move in and out of the area on a daily basis and can be easily spotted when the waters are fairly calm. When the ocean becomes rough, finding Killer Whales is a little tougher, but if the family has some large males, the dorsal fins rise many feet above the water. 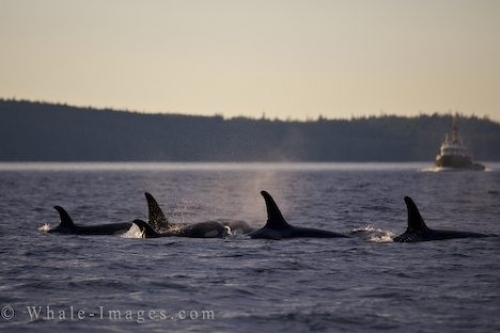 While visiting Vancouver Island, BC, be sure to head to the Northern end of the Island where life is very peaceful for humans as well as for the Killer Whales. One never knows when a Killer Whale family will appear and what type of behaviour may be on their agenda at any given time.